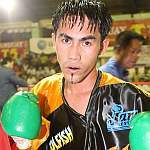 GENERAL SANTOS CITY – Undefeated light flyweight sensation Jether Oliva of this city is on a roll. On December 16, he only needed 44 seconds in the second round to knockout Rodel Tejares from Cagayan de Oro City to capture the Mindanao Philippine Boxing Federation light flyweight title at the General Santos City Oval Plaza Covered Court. Oliva uncorked a blistering five-punch combination capped by a right straight on the chin of outclassed Tejares who went down on all fours and was counted out by the referee. The General Santos City pug, a former amateur standout, started out strong, rocking Tejarers with crisp right straights in the first round. He almost dropped his taller opponent to the canvass as he pressed for the kill. Win the knockout victory, Oliva improved his immaculate record to 11 wins with nine KO victories. He will again see action against a still to be named opponent in Maasim, Sarangani on January 15 next year. The 22-year old Oliva, who has sparred with the likes of Z Gorres, Rodel Mayol and World Cup gold medalist Harry Tanamor, is one of the bright prospects to emerge from this city following Manny Pacquaio's sensational rise to boxing stardom. Oliva's fight was the main attraction of the December 16 birthday offering of Manny Pacquiao (MP) Promotion. Oliva is managed by JC Boy Mananquil. Also prevailing over their opponents were Ryan Tampus of Cebu who knocked out Arnold Pasaylo of Maasim in the first round, Ernie Fontanilla of General Santos who scored a 5th round technical knockout victory over Elmer Francisco of Bukidnon, Esrael Salud (GSC) via 1st round KO against Alan Tumala (Bukidnon). Jhon Ugbaniel also stopped Romulo Ramayan (Cebu) in the second cantos while Ryan Makiputin edged out Robert Orot (Gensan).